GearSlutz: "Is this what we've been waiting for for five years? Not sure, but you can't say it hasn't been Apple-fied""
Analog Industries: "My initial impressions are extremely favorable"
Create Digital Music:"The holy grail of music software right now: make it easier for people to actually play with computers. EM411:"Insanity. .. is anyone NOT going to buy logic at that price? How is more for less Disappointing? I was very, very close to paying almost $300 for Logic Express just last year... glad I didn't. 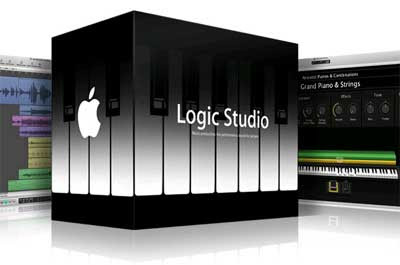 $500 for a full, brand new Logic is still a lot of bread for the average feller, but it's sure a lot more tempting than $1000, and with added features & a great bundle, too. I don't think my old Mac Mini is powerful enough for it though. Hmm. I'm not really sure where I'm going with this comment, so in closing, I'll just say that I'm currently eating peanut butter crackers, and they're very delicious. HOLY CRAP HOLY CRAP HOLY CRAP. It's $499!!! For Logic Pro! Will all instruments, all plugins, new GUI, and that new live thing I'll never use.. At what used to be the academical price! And no dongle! There's GOT TO BE A CATCH. This is too good a deal. Perhaps you have to become a vampire and gather blood at night. I think i just pooped myslef. The UK Apple store has Studio for £320. Even more mentally the Logic Express 7 upgrade to Logic 8 Pro is £65! That was £500 two days ago.